Home FUBAR White extremists: Biggest threat? 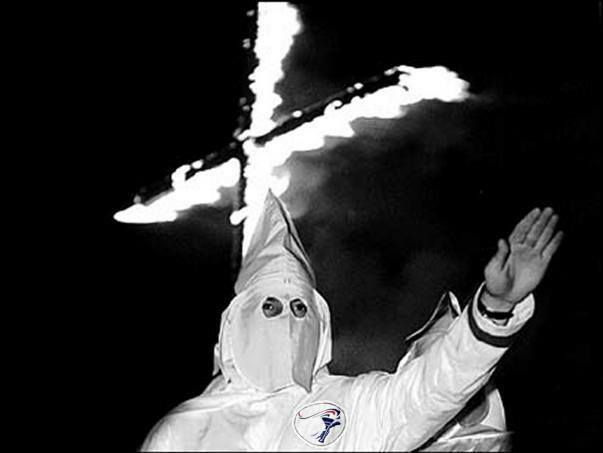 The Klan: More threatening than foreign terrorists? The threat of violence by people inspired by foreign extremists invokes fear in a majority of young Americans across racial groups. But for young people of color, particularly African-Americans, that fear is matched or surpassed by worries about violence from white extremists. A new GenForward poll of Americans age 18-30 shows widespread anxiety among young people about attacks from both inside and outside the United States. Sixty-two percent of young African-Americans and 55 percent of Hispanics surveyed said they were very concerned about the threat of violence committed by white extremists, compared to one-third of whites and 41 percent of Asian-Americans. Gregg Higgins, 27, was one of the whites who said he was very worried about violence by extremists in his own race. In fact, he said he was more concerned about “the homegrown white extremists” than the threat of violence from people outside the United States or people inspired by foreign extremists. “That fear of loss of control and loss of privilege is what’s inspiring this vitriol and this hate,” Higgins said. Worry about attacks from people currently living in the U.S. who are motivated by foreign extremists spreads more evenly across racial groups, with at least half of whites, blacks, Asians and Hispanics describing themselves as very concerned about that threat. Violence committed by people from outside the country also caused unease, especially among Hispanic young adults. Fifty-six percent of Hispanics polled said they were very concerned, compared to 49 percent of African-Americans, 40 percent of Asian-Americans and 41 percent of whites. The angst comes after a spate of mass shootings. Nine black people were shot and killed last year at a church in Charleston, South Carolina, by a white man who officials say talked of starting a race war. In June, a gunman born in the U.S. to Afghan immigrants opened fire in a crowded gay dance club in Orlando, Florida, killing 49 people in the worst mass shooting in U.S. history. An autopsy report identified him as a white male. Last month, five police officers in Dallas were killed by a black gunman during a protest against police shootings of black men, and three law enforcement officers in Baton Rouge were shot and killed by a black man who authorities said appeared to be targeting people wearing a badge. Darsi Vazquez, a 25-year-old Hispanic college student from Huntsville, Alabama, described herself as very concerned about the threat of violence from foreign and domestic extremists alike, but she thinks the fear is exacerbated by news coverage of mass shootings around the country and the types of overt racism that appear in social media. Most young adults in the poll labeled as hate crimes both the shooting deaths at the Charleston church and the Orlando night club, against African-Americans and against LGBT people, respectively. But the poll shows people view the Orlando shooting differently, depending on their race. Among young whites, most also described the Orlando shooting as a terrorist attack. Fifty-eight percent of whites considered it that, compared to only 32 percent of African-Americans, 40 percent of Hispanics and 44 percent of Asian-Americans. Gunman Omar Mateen pledged allegiance to the Islamic State group during a call with police dispatchers during a standoff before he was shot and killed. A third or less of young people of each racial and ethnic group called the Charleston attack terrorism. Terrorism concerns have young Americans across racial groups largely in agreement that some rights and freedoms should be sacrificed in efforts to prevent an attack. Eleven percent of all young adults polled said they believe such sacrifices are always necessary, while 54 percent said they’re at least sometimes necessary. But most young people said Republican presidential candidate Donald Trump’s calls to temporarily ban Muslims from coming to the U.S. goes too far. More than two-thirds of those surveyed said they oppose a temporary prohibition on any Muslim who isn’t a U.S. citizen from entering the country: 64 percent of whites, 66 percent of Hispanics and 79 percent of African-Americans and Asian-Americans. It’s a legitimate fear, given the fact that there have been significantly more terror attacks and acts of mass violence in this country by white men than there have any of the foreign extremists that people like Trump use to get the population riled up and violent. It’s only going to get worse, too, considering how the former head of the KKK now feels empowered enough by the Trump campaign to run for office, while the American Neo-Nazi’s have openly endorsed Trump and had an increase in membership and plans for action. Are you crazy? the muzzie hoards are the enemy why can’t you people figure that out? You better figure it out before it is too late.